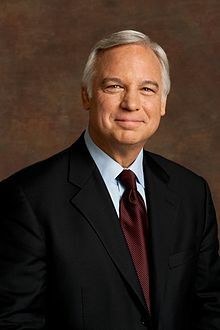 Jack Canfield (born August 19, 1944) is an American author, motivational speaker, corporate trainer, and entrepreneur. :453 He is the co-author of the Chicken Soup for the Soul series, which has more than 250 titles and 500 million copies in print in over 40 languages. In 2005 Canfield co-authored with Janet Switzer The Success Principles: How to Get From Where You Are to Where You Want to Be. Canfield began his career in 1967 when he taught a year of high school in Chicago, Illinois. He worked at the Clinton Job Corps Center in Iowa and the W. Clement and Jessie V. Stone Foundation in Chicago. In 1976 Canfield co-authored 100 Ways to Enhance Self-Concept in the Classroom. He ran a residential Gestalt center called the New England Center for Personal and Organizational Development and was named one of the Ten Outstanding Young Men of America (TOYA) by the U.S. Jaycees in 1978. Canfield is the founder and CEO of The Canfield Training Group in Santa Barbara, California and founder of The Foundation for Self-Esteem in Culver City, California. Canfield hosts a radio program and writes a globally syndicated newspaper column. He holds a Guinness World Record for having seven books on the New York Times best-seller list at the same time. In 2006 Canfield was featured in a self-development film called The Secret. His best known books include: The Power of Focus, The Aladdin Factor, and Dare to Win. In 2005 Canfield co-authored The Success Principles: How to Get from Where You Are to Where You Want to Be. He is a founding member of the Transformational Leadership Council. Canfield coauthored Chicken Soup for the Soul with Mark Victor Hansen in 1993. According to USA Today, Chicken Soup for the Soul was the third best-selling book in the United States during the mid-1990s. Canfield later co-authored dozens of additional books in the Chicken Soup for the Soul series. In his book The Success Principles: How to Get From Where You Are to Where You Want to Be. Jack Canfield has collected what he asserts to be 64 essential lessons for attaining goals and creating a successful life. The book is divided into six sections: The Fundamentals of Success, Transform Yourself for Success, Build Your Success Team, Create Successful Relationships, Success and Money, and Success Starts Now. These principles include the fundamentals, such as "Take 100% Responsibility for Your Life", "Decide What You Want", and "Believe It’s Possible", as well as those aimed at creating better relationships, such as "Keep Your Agreements", and "Speak with impeccability," and "Tell the Truth Faster." Canfield also presents ideas that he claims can create success with money, build a successful team, and how to overcome procrastination and get started. Canfield married in 1971 and had four children before he divorced in 1976. A few years later he remarried and had a fifth child. He divorced in 1999 and married for a third time in 2001. Canfield, Jack, and Mark Victor Hansen. 1993. Chicken Soup for the Soul. Deerfield Beach: Health Communications. Canfield, Jack, and Janet Switzer. 2005. The Success Principles: How to Get from Where You Are to Where You Want to Be. New York: Harper Element. Canfield, Jack, and Mark Victor Hansen. 1995. The Aladdin Factor. New York: Berkley Book. Canfield, Jack, Mark Victor Hansen, and Les Hewitt. 2000. The Power of Focus: How to Hit Your Business, Personal and Financial Targets with Absolute Certainty. Deerfield Beach: Health Communications. Canfield, Jack, and D.D. Watkins. 2007. Jack Canfield's Key to Living the Law of Attraction: A Simple Guide to Creating the Life of Your Dreams. Deerfield Beach: Health Communications. Canfield, Jack. 2007. Maximum Confidence: Ten Secrets of Extreme Self-Esteem. Audio CD – Audiobook. New York: Simon & Schuster Audio/Nightingale-Conant. ^ a b c d e f g h Unknown author. "Jack Canfield Biography". Business Leaders: Jack Canfield Biography. Woopidoo! Biographies. Retrieved 18 December 2015. ^ "Jack Canfield". Contemporary Authors Online. Gale. August 31, 2006. Retrieved on February 13, 2009. ^ a b c d Canfield, Jack; Switzer, Janet (2005). The Success Principles: How to Get from Where You Are to Where You Want to Be. Harper Element. ISBN 0007195087. ^ Starkweather, Llan (January 2008). Earth Without Polarity. The Wizard. p. 206. Retrieved July 29, 2014. ^ a b Canfield, Jack; Switzer, Janet (2006). "The Success Principles: How to Get from Where You Are to Where You Want to Be". Amazon.com. William Morrow Paperbacks. Retrieved 20 December 2015. ^ Ellis, Doug (2011). Transformational Leadership Council. Vol. II. San Francisco: Blurb Publishing. ^ "Amazon.com: chicken soup for the soul books canfield - Chicken Soup for the Soul / Paperback: Books". amazon.com. Retrieved 18 December 2015. ^ Canfield, Jack; Switzer, Janet (2015). "The Success Principles - 10th Anniversary Edition: How to Get from Where You Are to Where You Want to Be". Amazon.com. William Morrow Paperbacks. Retrieved 21 December 2015.